SPONSORED LINKS There, far beneath the ground, are the bones of two people. But that's not everything. The skeletons were estimated to be nearly 2,800 years old and belong to a man and a woman. Coined the Hansanlu Lovers following their discovery in 1972, the pair is estimated to have died together around 800 B.C., based on studies of a wound found on the man's head. According to the site Rare Historical Photos, the couple would have sought protection together in a bunker during a great war. When the town was burned down in a military attack, both sides fighting were killed in a rapidly escalating fire - meanwhile, the couple in the bunker were suffocated to death when the ground above them collapsed. The incredible? 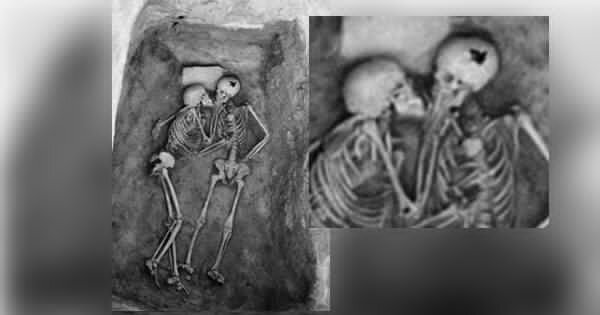 When the skeletons were excavated, the couple was discovered in exactly their final position - a position that truly reveals that love is eternal. The man's arm is wrapped around his woman, while the two connect in a final, immortal kiss. The two clearly held on to each other's embrace and protection until their final breath.